The technologies of genetic engineering have not been widely adopted for horticultural crops. In fact, outside of Hawaiian papaya and a small acreage of squash, there is no commercial acreage of genetically engineered fruits and vegetables in the United States. There are many reasons for this, including the high cost of deregulation and the poor societal perception of the technology that makes such approaches unattractive for specialty crop industries. These technologies are confined to use in large-acreage ag crops — at least for the time being. Scientists are disappointed by the slow adoption. There are many opportunities to improve plant quality, cut inputs, increase plant survival during weather extremes, fortify resistance to disease and produce dozens of other demonstrated benefits. These solutions have existed in laboratories and greenhouses for decades, but have yet to reach the field. However, this is about to change in a big way. The next wave of genetic modification is called gene editing, and you will see huge impacts of this technology in crop plants — as well as in animals and human medicine. It is critically important that everyone in agriculture becomes rapidly conversant in this technology, as it already has been a game-changer. 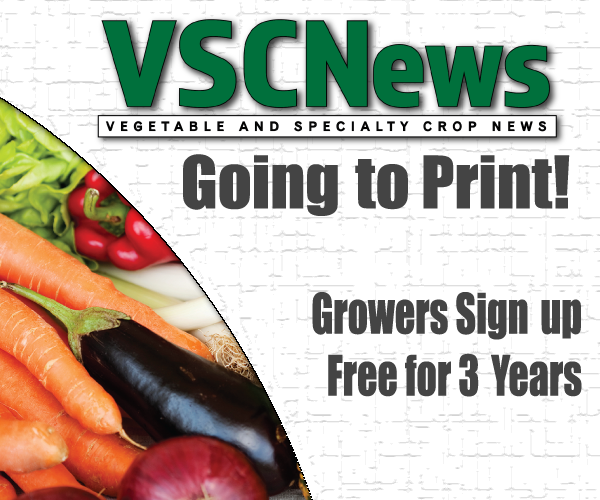 Going forward, this technology could have major impacts in fruits and vegetables. However, if the public does not understand it, and the vocal anti-technology movements are allowed to distort what it is and influence public perception, these revolutionary technologies may be slow to reach the farm and the dinner plate. 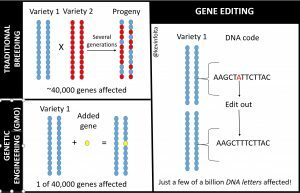 How is gene editing different from standard genetic engineering? Think of a plant’s DNA code as a library of books. Each “book” contains the recipe for a specific structure or function within the cell, and together the library of instructions controls the way a plant grows and develops. By analogy, the implemented genetic-engineering practices add new books to the library, but they are not necessarily books that traditionally belong there. New information is added, and the plants take on new traits. This is how plants can be made to withstand insects or herbicides — the new information added provides them a strategy to survive. Unfortunately, the process is considered invasive by some, and certainly the public looks at it with suspicion. While science shows these techniques and products to be safe, the high cost of deregulation and lingering public concern temper enthusiasm to improve fruits and vegetables with standard genetic-engineering techniques. But the process of gene editing is fundamentally different. Think about those books in the library again. 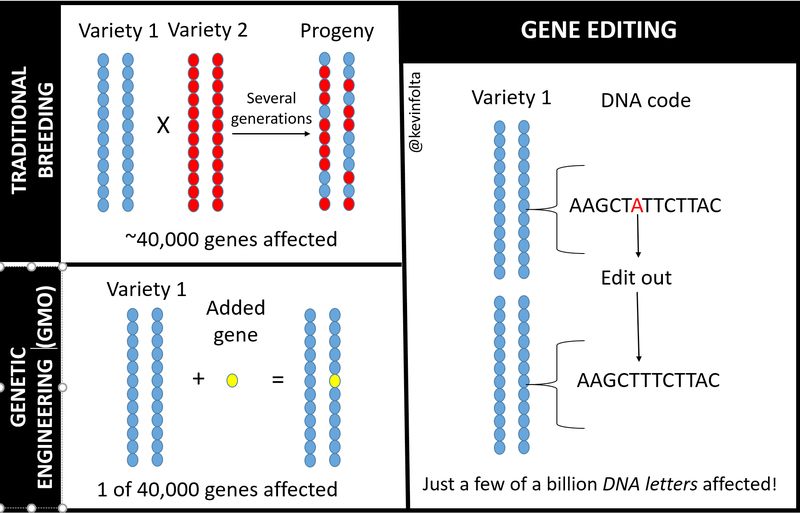 Gene editing is a process where a few words in one book in that library can be changed with great precision, affecting the information, and the structure and behavior of the plant. The big difference is that researchers decide which book, which sentence and which words to change. It is that precise. Technically, the process is called CRISPR, standing for “clustered regularly interspaced short palindromic repeats.” Yes, that makes little sense to the casual consumer. What the acronym means is not important, but it is critical to understand what this technology can do. Just about all of the variability we see in nature or on the farm comes from differences in gene sequence. The differences in DNA are reflected in differences in traits. Traditional plant breeding relies on moving many favorable traits into one genetic background by crossing them. In the past, there was no way to control the traits or DNA sequence. Plant breeders just used the variation that happened naturally due to evolution or random mutations from natural forces. This figure shows three methods of plant genetic improvement. Traditional breeding crosses two parental lines that contain favorable traits, and plant scientists hope to find all of the desirable traits (and no undesirable traits) in one of the offspring. Many genes are mixed in random ways. Genetic engineering (what is commonly called “GMO”) adds one entire gene to an already elite genetic background. Gene editing only brings slight changes to the genetic code that is already there. The most minor adjustments are made with gene editing. Today, scientists can use CRISPR gene editing to construct the changes in genes that affect traits of interest. There are many good examples of how this technology has been used already. Scientists can create the variation that they used to have to look for. In other words, rather than looking for the needle in the haystack, scientists place the needle exactly where it matters and where they can find it. In plants, it will be possible to edit disease susceptibility genes, making new varieties disease-free. It will be common to edit genes to make plants flower more abundantly (like in roses or fruit crops), or in some cases not flower at all (like in basil or lettuce). There are limitless examples of traits that can be adjusted. In animals, the technology has been used to eliminate the gene that leads to horn production in cattle. Two calves were born last year that normally would grow horns. Thanks to gene editing, they don’t, which means they will not have to be dehorned manually. This saves money in calf production, and the animal does not have to endure the polling process. African swine fever virus is a major problem in Europe. Scientists in Scotland have created pigs that should not get sick because a gene required for viral infection has been removed with gene editing. This technology could have tremendous implications for animal welfare and farmer profits. The most important message is that CRISPR-mediated gene editing will be a powerful tool for plant scientists and breeders to improve traits with great precision. It creates the changes seen with traditional breeding in a targeted way, but leaves none of the accessory sequences that sour the perception of conventional genetic-engineering techniques. It is critical that those close to agriculture and related industries understand what this technology can do and communicate it clearly to the public. Participate in online discussions, talk to friends, and actively learn of the good things we can do with this revolutionary technology. If these technologies are delayed because of misunderstanding, we will lose many opportunities to bring improved varieties to the field, and better fruits and vegetables for consumers. Kevin M. Folta is a professor and chair of the Horticultural Sciences Department at the University of Florida in Gainesville.